The trains connecting Leeds (Yorkshire and the Humber England) to Aberdeen (North Eastern Scotland) are run by Cross Country. The services on board will change depending on the train provider. 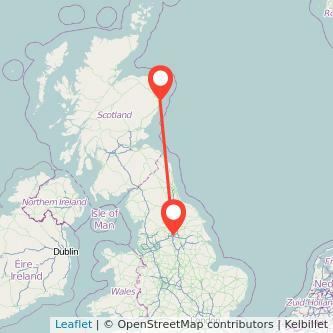 There are 232 miles between both cities and the average train duration connecting Leeds to Aberdeen is normally 7h43m. Travelling by train is normally the quickest solution to go to Aberdeen from Leeds, and it's also more environmentally friendly than taking your car or using the plane. We found trains from £28.90 to travel in the next 30 days. Fares may change depending on the travel date as well as how much time in advance you book your ticket. Find the cheapest tickets to travel from Leeds to Aberdeen by train, bus, ride sharing and plane. Based on our data, 3 trains from Leeds to Aberdeen are available today and 0 tomorrow. The first Leeds Aberdeen train leaves at 08:07 while the last train leaves the station at 15:08. The first and last departure hours can vary every day and there can be less trains during weekends as well as bank holidays. Train companies can as well adjust the number of trains during school holidays or depending on the demand. The chart above illustrates the best prices found over the last six months depending on how much time in advance the ticket is purchased. Buying your train from Leeds to Aberdeen in advance will enable you to pay less for your train. The cheapest tickets we found were from £37 when purchasing your train 1 month in advance which is 64% cheaper than the best price we found when purchasing your seat on the day you're travelling. We compare train ticket for all major companies to travel between Leeds and Aberdeen by train and find the best prices for the coming days. Take a look at the prices of train tickets Aberdeen to Leeds and find the best deal for your outbound journey. Looking to travel for less? Many railcards and discounts are available to spend less for your Leeds Aberdeen train ticket and save even more money on your tickets: special train fares for children, railcards for all ages, group travel, or charity discount. There are five types of railcards available: 16-25 railcard, Two together railcard, Family and Friends Railcard, Senior railcard, Disabled persons railcard. For your assessment, you have to include the cost of your railcard, i.e £30, your savings on each journey (i.e. : 34%) as well as the cost of your ticket. The average price of a Leeds Aberdeen ticket is £126.97 (1). Divide the cost of your railcard by the discount: £30/34%= £88. Then divide £88 by £126.97: £88/£126.97 = 0.69. You will need to make about 1 trips from Aberdeen to Leeds (one way trip) with your railcard to break even. The price to buy a Disabled persons railcard is £20 while it will cost you £30 to have the 16-25, Two together, Family and Friends or the Senior railcard. All of them enable you to save 34% off most adult fares for an entire year.